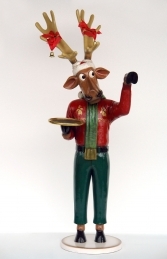 Our Funny Reindeer Series is hugely popular; children love the comic faces of these charming models. 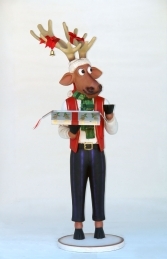 The reindeer characters come in two sizes; the minis make great decorations for window displays, table tops & around the home, while the larger models are super to use in Christmas grottos & displays. 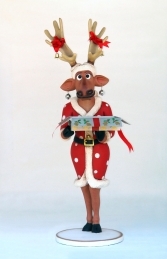 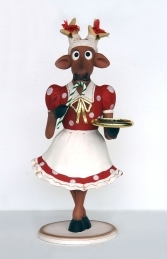 The series of funny reindeer includes the models in a range of poses & in combination with santas & elves. 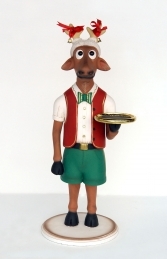 The Santa & funny reindeer coming out of a chimney fireplace would look sensational as a centre piece in a Christmas display. 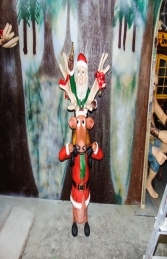 We have a lovely flying funny reindeer on a stand with a Santa in his sleigh which makes an excellent promotional piece for any business who wish to advertise Christmas parties & events. 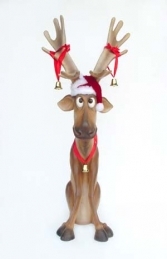 These funny Reindeer figures look fantastic in groups, especially with our snowmen & Santa models; however they also make charming decorations for the private home & garden.